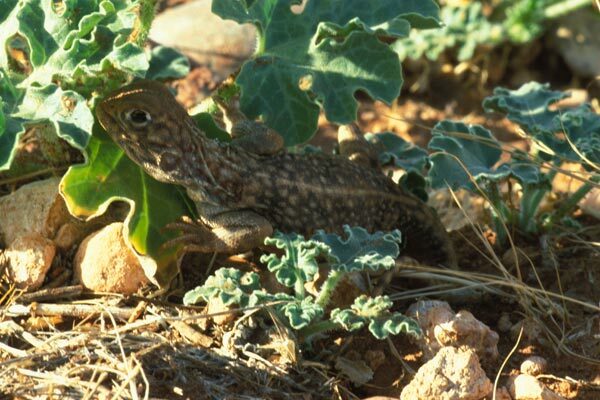 We saw a few of these little tykes standing proud on the berm at the side of the dirt road we were cruising down with our Australian buddies Martin Cohen and Julia Cooper. 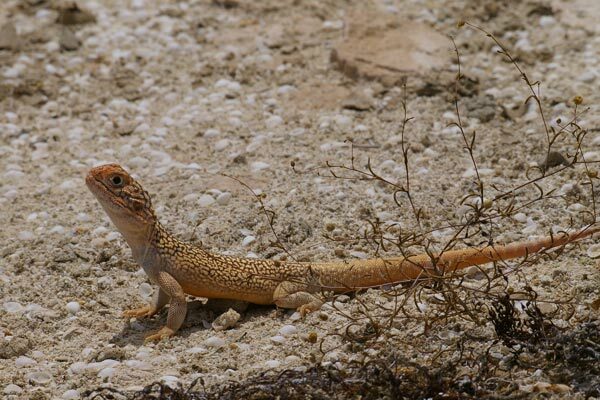 Each time we saw one I'd hop out of the car and grab my camera, but by the time I had reached the spot where the lizard had been, it had taken the opportunity to dive down the nearest hole. Finally this one decided to crouch down into the foliage rather than hiding completely. This lizard was basking motionless on the highway when I spotted it. I got out of the car, picked it up, showed it to my wife Monica, and placed it on the desert floor nearby. Monica decided that on the basis of its size, shape, pattern, and immobility, it was the lizard most like a bean bag that she had ever seen. 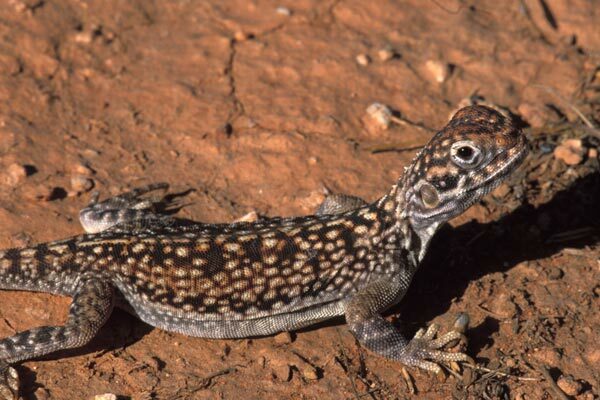 This was my first lizard in the Shark Bay area to which we had come from half a world away in search of lizards (and dugongs). On a hot afternoon, it was basking near the boardwalk to the world renowned Hamelin Pool stromatolites, where my wife Monica spotted it. I think all the stromatolite-visitors were wondering what the heck we were doing following a lizard around. We spotted this netted dragon on the road ahead, so naturally we stopped to investigate and take some pictures. 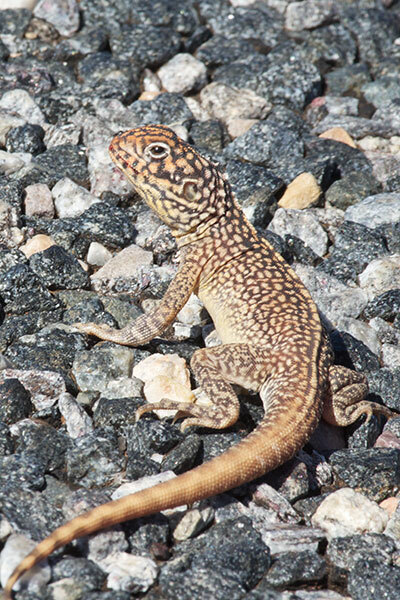 After a couple of photos, we saw another car approaching in the distance, and we were afraid that the lizard might run the wrong way. So we quickly moved to the other side and gave it a nudge. The first nudge provoked no reaction, but after a second nudge it raced off the road and into the bushes. Another day, another lizard saved. 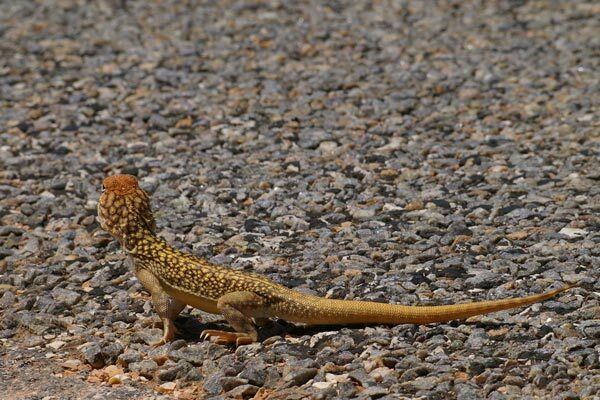 I saw a number of these dragons on roads on this trip, but unlike the bean bag lizard from 2003, they tended to race off long before I could get close enough for a photo. I managed to photograph this one through the (open) car window before it too raced off.